A HISTORY OF THE COMPANY - G & R WRENN LTD. The ‘G’ and ‘R’ in the name "G & R Wrenn Limited" represent the names of George and Richard Wrenn, brothers, who started the now famous Company in 1950. A third brother, Cedric, was to join the Company in the late 1950s. The ‘family’ business continued right through until 1992 with the exception of a few years in the late 1960s when G & R Wrenn lost its independent existence and became part of the Lines Brothers Group. In late November 1992 ‘G & R Wrenn Limited’ ceased trading and the name and assets of the company were later bought by David Boyle of Dapol Model Railways. The ‘George’ and ‘Richard’ Wrenn who signed the Deed of Partnership on 29.11.1950, commencing the original Partnership known as "G. & R. Wrenn" - were George Raymond Wrenn, b. 11.12.1920 and Cyril Richard Wrenn, b. 5.3.1922, brothers. The Partnership was signed for an original period of 5 years. The brothers’ main business was the manufacture of high quality track-work and points for ‘OO’ Gauge model railways and the business premises were at No. 123 Lee Road, Lee Green, Blackheath, London S.E.3. 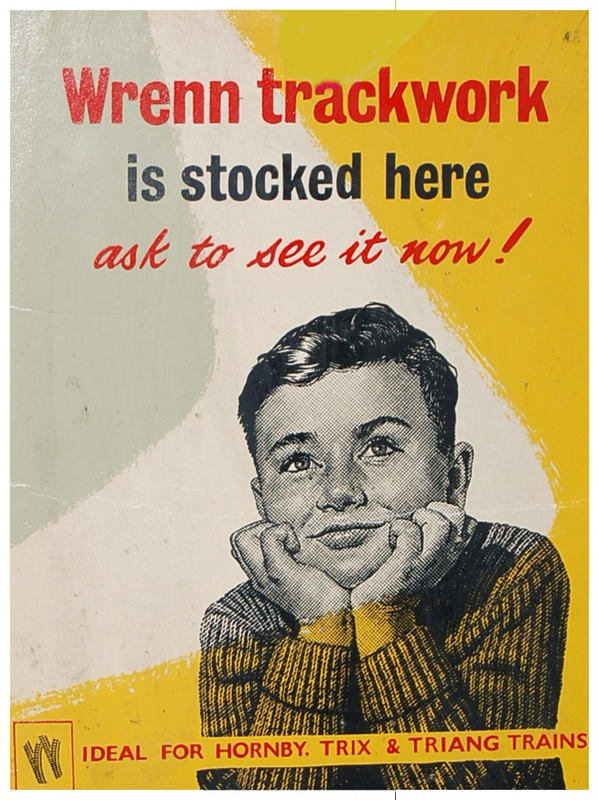 They produced track for both 2 and 3 rail operation in compatible format for use with Farish, Hornby, Tri-ang, Trix, and also a Universal pattern. In 1952 extra staff were taken on as the business expanded, and ‘Ray’ Wrenn (as his family always knew George Raymond) employed his first Secretary, a young girl called Audrey, whom he later married and in 1956 she became Mrs Audrey Doris Wrenn. The Partnership Accounts for the 15 months period, ending 31st March 1953 showed a Trading turnover of £12,562-12s-2d (£9,580-6s-2d after deduction of Purchase Tax) with a profit of £1,713-15s-9d In March 1955, because of continued increase in business and expansion in necessary work-space, the business moved across London to Unit 9, Bowlers Croft which was located in Honywood Road, Basildon. Continued expansion eventually brought in the additional Bowlers Croft Units so as to provide business space at Nos. 7, 9 and 11. Mrs Audrey Wrenn had left employment with the Wrenn business because of the move in 1955 and did not return to work with the Company until 1966, 3 years after the birth of their daughter, Vanessa. Audrey eventually became Company Secretary and she remained a Director of the Company until its final sale in 1993. The next major event for the business was in October 1957 when the ‘Partnership’ was transferred into a Limited Company, G. & R. Wrenn Limited. The original share issue of 10,000 £1 shares, dated 8th January 1958, was divided equally between George and Richard who were both shown as ‘Engineers’ in the Company Articles of Association, George having served his Apprenticeship with Vickers-Armstrong Ltd.
George and Richard were ‘Joint’ Chairmen of the Company and Richard was also Company Secretary. The Partnership Accounts for the period between 1st April 1957 and 31st October 1957 (prepared on the move to Limited Company status) showed a turnover of £32,258-11s-1d (£25,736-7s-11d after deduction of Purchase Tax) with a profit of £5,235-12s-0d. In August 1957, just prior to the founding of the Limited Company, Richard Wrenn wrote formally to his brother Cedric, encouraging him to join the Company ‘as soon as is humanly possible’. The letter recognised that Cedric would need to ‘wind up’ his business interests in Antiques and then continued that the possibility of him starting before September would be very nice, even if he must return to wind matters up finally. The letter does seem to be written in a very formal manner, even for the time of the late 1950s. A hand-written note across the ‘copy’ of the letter found in the Company files suggests a possible reason – "Letter sent to Cedric for the purpose of assisting in the sale of his business possibly as a going concern". Shortly afterwards John Cedric Wrenn joined his brothers in their venture, eventually becoming Sales Director of the Company, a position which he held until his retirement in March 1982. 1960 saw the introduction by G. & R. Wrenn Ltd. of the ‘152’ Series Racing Car system, smaller in scale but very much the major competitor to the ‘Scalextric’ system owned and at that time being developed by the Lines Bros. Group. The early inventors of ‘Scalextric’, Minimodels Limited, was bought by the Tri-ang Group in November 1958 who then set about a wide range of improvements and additions. Advertising literature of the day announced "in 1963 four new cars were launched, complete with Tri-ang's RX motor and accurately moulded plastic bodies. The variable speed hand throttle replaced the original 'dapper' type controller and the construction of new track sections and buildings enabled authentic reproductions of actual race tracks to be launched." The Wrenn 152 system started life as an ‘AC’ control system, but by 1965 you could buy sets and accessories for either ‘AC’ or ‘DC’ control systems. 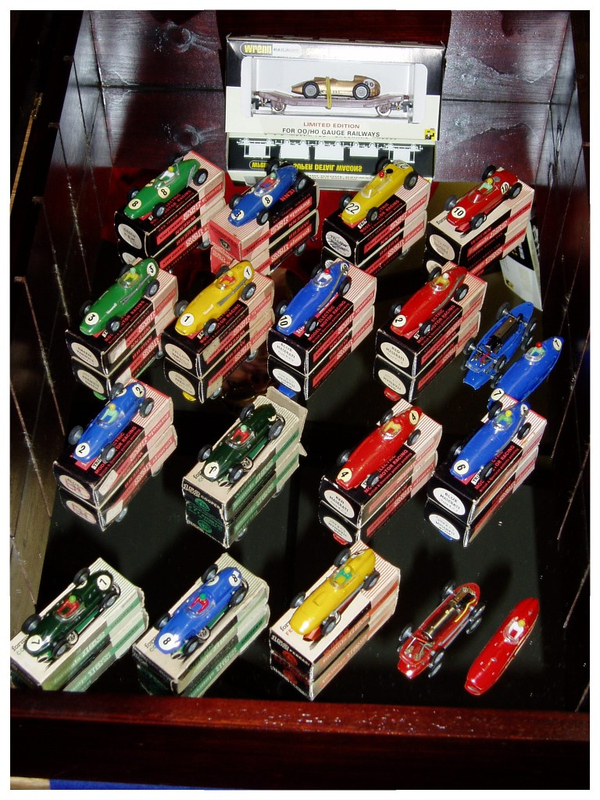 G. & R. Wrenn Limited produced a range of non-railway toys as well as the '152' Series Racing Cars, such as: The Master Mariner Set; The Wrenn Wonder Boat; Battery Operated Motor Boats (The RAF Tender shown below); Mighty Midget 3-6 Volt motors; A baby alarm; Doodle Discs; and The Pull Back ‘n’ Go Mini. In a joint Press Release, "The Directors of British Trix Ltd. and G. & R. Wrenn Ltd. jointly announce that they have reached agreement whe reby the famous range of WRENN products will be, starting 1st June 1964, sold on the Home Market by British Trix Ltd." The Press Release continues, "Apart from their famous series of model railway track and accessories, Messrs. Wrenn Ltd. are well known as the makers of the famous Formula ‘152’ Triple Electric Model Motor Racing." (the word ‘triple’ was in reference to the fact that you could race 3 cars on each track and also change lanes) The G. & R. Wrenn Company Records show that in May 1964 they issued a series of Debentures (Loans) up to the value of £20,000. In August 1964 the 1st Debenture for £10,000 was issued to British Celanese Ltd. (one of the associated Companies of British Trix Ltd.) with another for £5,000 being issued in June 1965. It seems that George and Richard Wrenn needed to raise money for the Company and in this way they were able to do so without selling their shares in the Company. One of the ‘costs’ associated with the Debentures was that British Trix Ltd. established one of their Directors, a Mr. James Richard Samuel MORRIS, as a Director of G. & R. Wrenn Limited. The Company return for 1965 shows Mr. Morris as a Director of both Companies and also – National Plastics Ltd., Celanese Building Comp. Ltd., British Lego Ltd., National Plastics (Holding) Ltd., Ecme Ltd., and Lanarkite Ltd., most of these being companies associated with British Trix Ltd. Whatever happened between the two companies over the next few months, or, whatever agreements were struck between Richard Lines and George Wrenn at the 1965 British Toy Fair, perhaps we will never know, but, by 16th October 1965 the Series of Debentures with British Celanese Ltd. were returned to G. & R. Wrenn Ltd. as ‘Wholly Satisfied’. This ‘re-purchase’ and clearance seems to have been a pre-cursor to Lines Bros. Ltd. buying 6,666 of the 10,000 shares in G. & R. Wrenn Ltd. on the 1st January 1966. These shares were bought in equal proportions from both George and Richard, leaving them with 1,667 shares each from their original 5,000. 1964 was the date of the collapse of ‘Meccano Ltd’ of Binns Road, Liverpool. Meccano Ltd. had been the producers of Meccano, Dinky Toys, Hornby ‘O’ gauge trains and of course, ‘Hornby Dublo’ die-cast model railways. The Meccano Company had been taken over by the Lines Bros. Group on 14th February 1964 with the purchase of full share capital for £781,000 (big, big money in 1964 prices!!). Early activity for the newly acquired stocks (especially the stock of Hornby Dublo 3 Rail items) was to sell them as quickly as possible through various retail outlets. Apparently Colonel Beattie (of Beatties Models) sold over 1,000 Dublo 3 Rail locomotives at less than half of their retail price, from his Southgate shop, in the month of April 1965 alone. The problem was though, that if the market was flooded with too many model railway engines, then the sales of Tri-ang products themselves would obviously suffer. The winter of 1964/65 was spent planning the fine detail of how the products of the two companies would be amalgamated. Whilst Dinky Toys and Meccano would be useful additions to the product lines, maintaining two competing railway product lines did not seem to be a viable option. On the 1st May 1965 it was announced that the two systems would merge under the Brand name of "Tri-ang HORNBY". As soon became apparent, however, the Tri-ang Railways system continued almost as before, but under a new name. As mentioned in the previous paragraph, G & R Wrenn had also been ‘absorbed’ into the Lines Bros. Group of companies on 1st January 1966, but undoubtedly the ‘purchase’ was the result of the Lines Bros. planning which had taken place during the previous 12 months. In my opinion the purchase of the majority share-holding in G. & R. Wrenn Ltd. had probably been seen by Lines Bros. as the preferred route to use, and benefit from, the acquired Hornby Dublo moulds and products without introducing any market competition from competitor companies. This thinking is supported by the fact that Lines Bros. bought Meccano Ltd. nearly 11 months before they bought the shares in G. & R. Wrenn. Whilst there were some obvious business benefits in buying control of G. & R. Wrenn Limited, it seems to me that there must be a mention of the Wrenn 152 racing car series, the major market competitor to the Lines Bros product ‘Scalextric’. In May 1965 Wrenn had issued a Trade Price List which included 6 boxed 152 sets, 2 extension packs, 20 AC and DC cars, 16 different track sections, 4 buildings, 11 Accessories, 10 Service packets, 5 Layout construction items and an AC and a DC transformer. Within 18 months there was no mention of the Wrenn 152 Series in their Price Lists whatsoever and the whole Series was withdrawn from sale. Was there a connection I wonder between the provision of the Hornby Dublo moulds to G. & R. Wrenn Ltd, and the withdrawal of the Wrenn 152 racing series? Less than 12 months after being taken into the Lines Bros. Group, December 1966 saw the first Wrenn locomotive, "Cardiff Castle" being advertised for sale (the Castle locomotive of course being one of the original Hornby Dublo products). The moulds had been altered and updated to imprint the name "G &R Wrenn Ltd" onto the under body of the locomotive and the first of the many G & R Wrenn Locomotives was born. G. & R. Wrenn Ltd. was also selected by Lines Bros. as one of the routes to market and sell the still remaining items of Hornby Dublo stock of completed locomotives, wagons and coaches as well as Hornby Dublo parts and spares. The range of new Wrenn versions of ex-Hornby Dublo locomotives was expanded in 1967 to include the Stanier 8F Freight 2-8-0 and the 2-6-4 Tank locomotive. The link between the two companies already actually existed in a less visible way as by 1968 the remaining stocks of Tri-ang ‘TT’ (Table Top) scale model railways were already being sold under the name of "Wrenn Table Top" products. Another earlier, and even less obvious link between Wrenn and Tri-ang was the fitting of the Tri-ang Mark 4 couplings (tension-lock) to all Wrenn products, rather than staying with the original Hornby Dublo type couplings. The ‘Tri-ang WRENN’ locomotives and wagons were sold in completely new boxes to mark the change in Brand Name. The Tri-ang WRENN era covered the period between January 1970 and January 1972. The year 1972 saw the separation of G. & R. Wrenn from the Lines Bros. Group, and of course Tri-ang, back to an independent family owned company. Although ‘Tri-ang HORNBY’ continued to advertise Wrenn products in their catalogue for that year, 1972 saw the move back to "G. & R. Wrenn Limited", and the third style of brand image with the introduction of the now famous "guard with the Union Jack" in 1973. Some would argue that this ‘third’ period actually covered time all the way through to the end of trading in 1992, but, for those who collect variations in box styles, there was a significant change in the box information for both wagons and coach boxes around the period of May 1980. This twelve year period saw the introduction of in excess of 70 new wagon identities to the catalogue, with many of the previous production identities also being continued. New identities for locos and coaches also substantially extended the existing catalogue numbers. As the final decision to ‘cease trading’ was announced to the retailers in October1992, with the announcement of a ‘Closing Down Sale’, final orders were taken from the retailers and many people began the scramble to buy the last of the Wrenn products, particularly at that time, the locomotives. In addition to the ‘final sales’ to the retailers, many individual collectors visited the factory to buy the very last of the ‘Basildon’ made Wrenn Railways products. News of the ‘take-over’ by Dapol appeared in a ‘News Special’ section of the Railway Modeller in August 1993. The moulds, the presses, the parts, the spares and whatever completed items remained, were transported to the Dapol premises in Winsford, along with the paper records of the company, and David Boyle and his staff began the initial process of sorting out what they actually had. Adverts appeared in the Railway press in August 1993 encouraging people to take their ‘last chance to buy original Wrenn wagons in Wrenn boxes’, on average at £10 per item (Big money in those far off days when most Wrenn wagons on the secondary market were changing hands at £6-£10 each). On reflection of course there were some real bargains to be had – W5100 Wrenn Railways Ventilated Van and W5105 Jaffa at £10!!! These adverts continued until April 1994, and the wagons that were sold did appear in original Wrenn boxes, but, predominantly with Dapol style printed labels on the box ends. These wagons (58 of them) are now catalogued as "The Winsford Wagons" and are highly collectable as a complete and different set. Much of the energy of Dapol seemed to be deflected from Wrenn railways products at this time, with no locos ever being offered for sale, no coaches ever offered for sale, and no further advertising for the sale of the wagons. The energy seemed to be consumed in the move of the Company from Winsford in Cheshire, to its new home at The Lower Dee Mill in Llangollen, Denbighshire. The Company started the transfer of their production line in late 1994, to the new Llangollen site. In January 1995, with some of the Wrenn items still at Winsford, there was a massive fire at the Winsford site, with literally millions of pounds worth of damage to the contents. Luckily (for Wrenn collectors at least), the majority of the Wrenn items had already been moved to the new site at Llangollen, but undoubtedly, the fire consumed a large part of the G. & R. Wrenn history in art-work and records. Nothing much happened on the Wrenn front for the next few months, other than several hints or announcements in the Railway Press that Dapol would soon re-start production of the original Wrenn die-cast locomotives. The first loco to be produced was going to be the Bulleid ‘Re-built’ Pacific and it would be available in any identity that Wrenn had actually produced (perhaps because transfers and name-plates already existed?). In any event, and for whatever reason, the production of the locos never took place. Planned production of a large number of the previously issued Wrenn wagons was also captured in the ‘Dapol’ 4th Edition Catalogue. In November 1997 Dapol announced that they were to start the sale of two new catalogues of previous Wrenn wagons, which they introduced as their "WR1" and "WR2" ranges. The WR1 Range consisted of original Wrenn wagon bodies mounted on original Wrenn wagon die-cast chassis, but fitted with Dapol couplings and Dapol pin-point axle wheels. These wagons were sold in Dapol boxes and were priced at £14.99. The WR2 range consisted of original Wrenn wagon bodies mounted on Dapol plastic chassis, with Dapol wheels and couplings and were also sold in Dapol boxes priced at £7.99. They also introduced a new WR3 range which consisted of entirely new Dapol-made wagon bodies on Dapol chassis and Dapol boxes, but made using the original Wrenn wagon body moulds, now refurbished and taken into the Dapol production system. In November 2001, three avid Wrenn collectors came together and bought the G. & R. Wrenn Company from Dapol Ltd . They acquired the Company name, the Registered Trade Marks, the original tools and presses (with the exception of the wagon tools that had been absorbed into the Dapol production lines) and all of the then remaining parts and spares. There was never any intention of re-opening a fully functional production line factory for Wrenn products, but it was rather an attempt to preserve the identity of the original Company and to prevent any other prospective purchaser acquiring the Company and moving it, and production, abroad. In the first year under new ownership the Company produced a new Limited Edition wagon (W5510) and a new Limited Edition Golden Arrow Pullman coach (W6105P). A second Limited Edition wagon (W5511) The Black Milk Marketing Board 6 Wheel Tanker was issued during October 2003 and a third wagon (W5512) - a Lowmac Wagon with Racing Car Load was issued during 2005. In early 2007 a new Guards Van W5513 was issued and then in October 2007 the Company celebrated its Golden Jubilee - 50 years since the formation of the Limited Company. The Jubilee was marked with a special event held at Stafford Showground in conjunction with Barry Potter Toy fairs - a Golden Jubilee wagon (W5515) was launched along with the Official Wrenn Collectors Club. A book, entitled "THE STORY OF WRENN - From Binns Road to Basildon" covering the history of the Company and the production of all OO/HO gauge model railway engines, wagons and coaches between 1966 and 2003, written by Maurice Gunter, was published by Irwell Press in early 2004. The book contained full Catalogue number details of all of those products, in each of the production periods, together with estimates of current prices you would expect to pay for ‘Mint’ examples of such items. For the very first time the production figures of Wrenn Railways products were able to be published – laying to rest many of the ‘folk-lore’ tales about the rarity or otherwise of certain locos, wagons and coaches. That book has been OUT OF PRINT since 2006. A new SERIES of Books, in A4 soft-back format, have now been published by Maurice Gunter himself in order to update the original book. The format of the books is also different in that the original book contained details of wagons, coaches and locos issued in certain time periods, starting in 1966 and finishing in 2003. The new Series will consist of 4 Parts, Part One was published in February 2011 containing details of box packaging, Company production Periods, the history of the Company and a Collectors list of Catalogue numbers. Part Two, published in December 2011 contains details of everything to do with Wrenn LOCOS, Class by Class rather than by time Period - so, anything you need to know about, say, Sir William Stanier City/Duchess Class locos, will be found together in one place. Part Three of the Series covers everything to do with Wrenn Wagons in a similar way and was published in April 2014. Maurice is currently working on Part Four which will cover Coaches, Brighton Belles and Train Sets and it is still a work in progress. Details will be announced when the book is ready. As of the 14th March 2017 a new Company, using the G & R Wrenn Ltd. name has been incorporated but this is in no way connected to the Company that was based originally in Basildon and most recently in Cheshunt between 2001 and 2016.